The cataplana is a hinged metal pan shaped like an oversized clam shell. 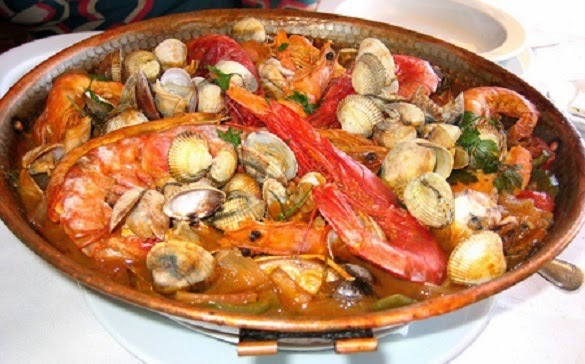 The Portuguese use it to cook this marvelous seafood stew. A good substitute for cataplana is a wok with a tight fitting lid. Make sure you use seafoods that are really fresh as well as good quality olive oil and wine. 1. In a cataplana, or large wok with cover, pour in olive oil. Add the peppers, onions, tomatoes and chili. 2. Scrub and clean well all the seafoods. Add seafoods to the pan. Pour in tomato sauce, wine and water. Sprinkle parsley, garlic and salt. 3. Cover cooking pan and cook on high heat for 5 minutes. Reduce heat to medium and continue cooking for 10-15 minutes or just until seafoods are cooked through. 4. Serve with bread or rice.